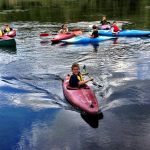 The Scout Section is for all young people aged between 10½ and 14. The Scout Troop is the third and final Section in the Group, after which Scouts are encouraged to join Explorer Scouts. Explorer Units are run on a District, rather than Group level. Scout activities focus on outdoor fun, adventure and challenges. The Troop holds several camps each year, including a 10 day Summer Camp. On camp the Scouts develop skills for outdoor living and survival. Scouts work towards a number of Challenge Awards and Activity Badges. Our Scout Leader is Jules Stannard, supported by Assistant Leader Paul Gomm and Group Scout Leader Simon Kelly. If you would like your child to become a Scout, please click here and add your details to our membership waiting list. We will then be in touch with you to discuss a start date with you.